Deptford X supports and develops artists, producing ambitious, context-specific works and presenting them to a wide range of audiences. 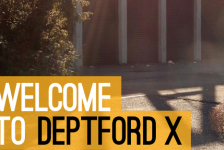 Deptford X is London’s longest running contemporary visual arts festival and has been experienced by over one million people since inception in 1998. The nomination panel for 2016 commissions is composed of George Vasey, Ellen Mara de Wachter, David Mabb, Roszas Farkas and Fatos Ustek.